When my kids were little, invariably most every night one of them spilled their glass of milk or juice. Who cleaned it up? Mom, of course. When they got older and made a mess, who cleaned it up? They did, maybe with some help from Mom. Now that they are grown, they usually have to clean up all by themselves. What about YOUR messes? Who cleans them up? There are three kinds of messes in our lives. Messes we make all by ourselves. Messes someone else makes and we are in the middle of it. Messes the devil makes for us. Messes we’ve caused by ourselves are probably the simplest to clean up (simple, but not always easy!) Some of the messes we create: financial trouble by making poor money decisions, not saving, borrowing too much, living beyond our means; poor health due to abusing food and drink and/or not exercising, ignorance regarding our own bodies; career troubles due to procrastinating, not paying enough attention to the important things, bad habits and addictions, and more – the list goes on. 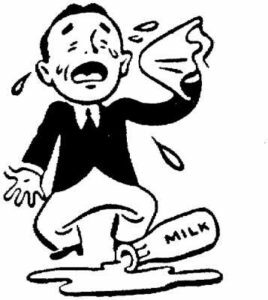 We fix those messes by repenting for them, turning back to God and asking Him to divinely help us clean up the “spilt milk”. It takes a quality decision to change our ways. Messes caused by others are not so simple to fix because another’s soul (mind, will & emotions) is involved, not just ours. A cheating spouse; a thieving employee or partner; an auto accident; a crime committed against you; etc. Just because the mess is caused by someone else does not mean we are helpless in the situation. God also gave us free will and the power of choice. We can choose to extricate ourselves from the situation by leaving the abusive relationship. We can fire the dishonest employee and be more careful with the next hire. We can hold people accountable for the harm they have done, either through the legal system or the church’s biblical process. Messes caused by satan are those that are made to disrupt your life. They seemingly come out of nowhere and are meant to sideline you through discouragement, despair and hopelessness. The word is crystal clear on how we are to handle demonic attacks. We are to submit to God, resist the devil and he must flee. (James 4:7) Jesus gave us power and authority over the enemy. So often we cave in when the devil attacks. We slip into victim-mode, and while that is understandable, it is not acceptable for kids of the King to roll over. When Jesus was attacked by the devil, He used the Word of God against him. We can, too! No matter which of the three messes you find yourself in, cry out to God saying, “Help clean up this mess, Lord!” If you sincerely want out of your mess, He sincerely will help you.